43. BRI'ZA, L. Quaking Grass. (Gr. to nod, as in sleep; alluding to the pendulous spikelets.) 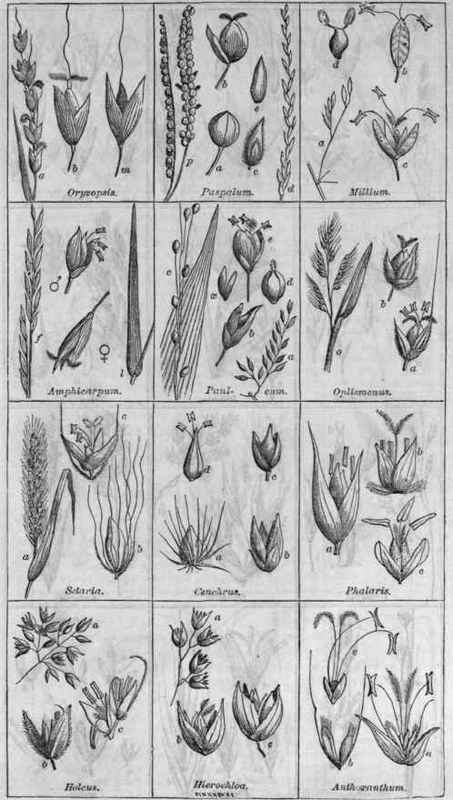 Spikelets cordate, 6 - 9-flowered; glumes 2, shorter than the lower flowers; paleae ventricous, lower one cordate at base, embracing the upper which is suborbicular and much shorter; caryopsis beaked. - Paniculate spikelets large, drooping on slender pedicels. 1 B. media L. Culm naked above, 1 - 2f; lvs. flat, smooth, lance-linear; stip. short, obtuse; pan. erect, few-flowered, branches wide-spreading, capillary, purplish, bearing the ovate cordate, tumid, pendant and tremulous spikelets at the ends, these are about 7-flowertd, greenish-purple; paleae, veinless. - Meadows and pastures, coastward, N. Eng. to Penn. May. § Eur. 2 B. maxima L. Pan. nodding at the summit; spikelets oblong, cordate, 13 to 17-flowered. - Gardens, occasionally cultivated as ornamental, † Eur. 44. UNI'OLA, L. Union Grass. 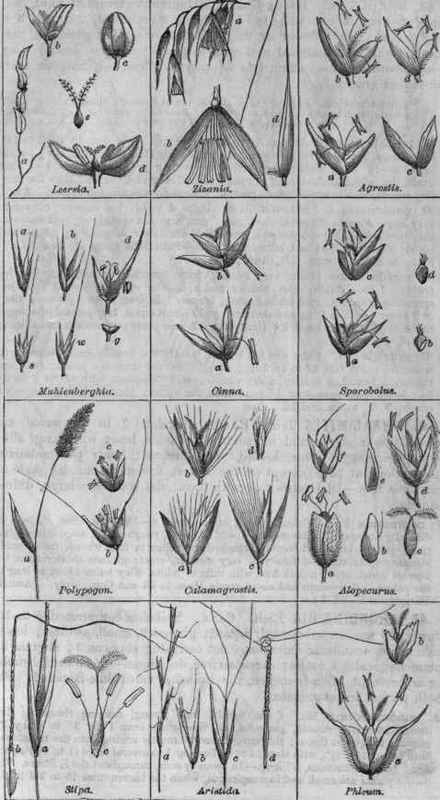 (Diminutive from Lat.unus, one; many flowers in one spikelet.) Spikelets compressed, 2-edged, 3 to 20-flowered; lower flower or fls. 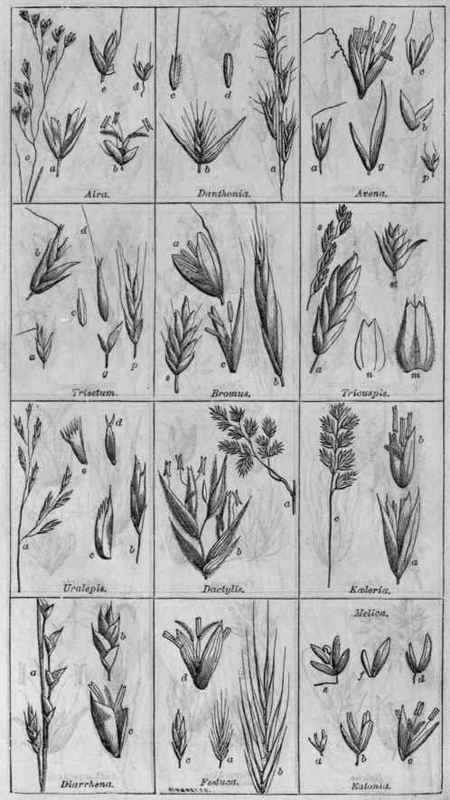 neutral, of one pale; glumes 2, cari-nate; lower pale flattened and wing-keeled, the upper double wing-keeled, both awnless; stain. 1 or 3; caryopsis free. - Smooth, erect, Hat-leaved grasses. 1 U. latifolia Mx. Culm 2 to 4f, smooth, subsimple; lvs. 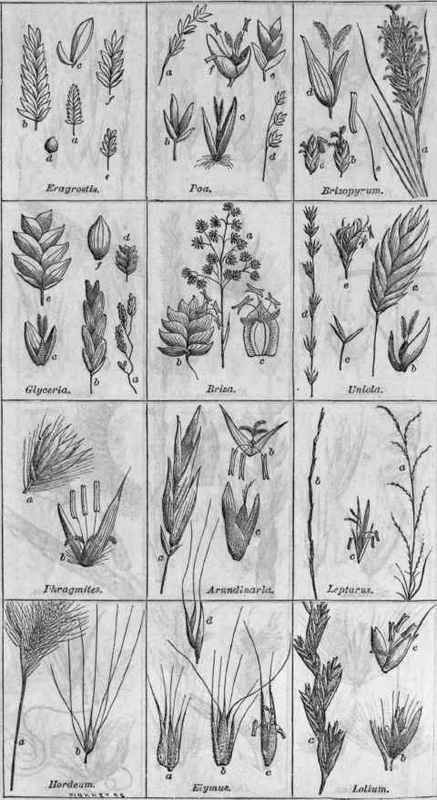 8 to 18' by 6 to 12", lance-linear, glabrous, rough-edged; sheaths longer than the internodes; panicle loose, 8 - 12' long, nodding; spikelets all on long peduncles, about 10" long, ovate, flat, about 10-flowered; glumes unequal, near twice shorter than the fls. - Dry woods, middle and Western States. Singularly elegant and showy. Aug.
2 U. paniculata L. Sea-side Oats. Culm 4 to 8f; lvs. narrow, convolute, very long; sheaths fringed at the throat; pan. large and spreading; spikelets ovate, short-pediceled, 12 to 20-flowered, several of the lower fls. neutral; pales about equal; the lower 9-veined, obtuse; stam. 3. - Sand hills along the coast, Va. to Fla. A tall rank grass. Jl, Aug.
3 U. nitida Baldw. Culm very slender, wiry, branched below, 2 to 5f; lvs. narrow, 2 to 4" wide; pan. 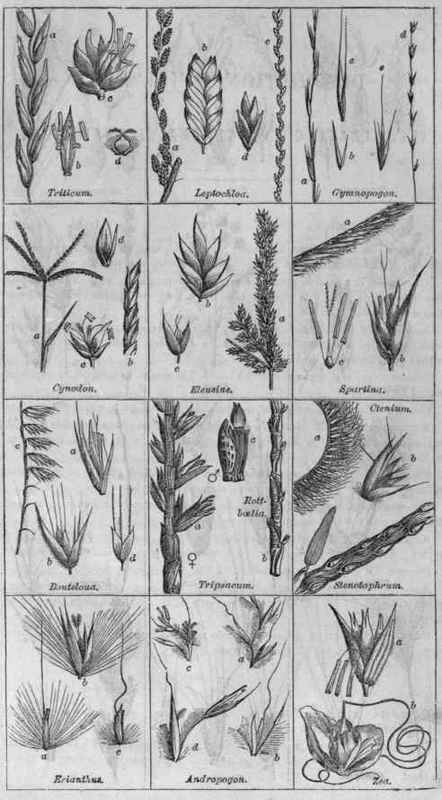 slender and spike-like or with several spike-like spreading branches; spikelets subsessile, broader than long, about 7-flowered, the 2 or 3 lower and the 1 highest abortive; pales about equal, long-pointed, the upper re-incurved at base-; stam. 1. Ga. to La. Whole plant very smooth and shining. Jn., Jl. 4 U. gracilis Mx. Culm slender, leafy, 3 to 4f; lvs. broadly-linear, tapering to a slender point, flat, 12 to 18' long; sheaths shorter than the joints; pan. long racemous, branches solitary, short, remote, erect; spikelets with about 3 fertile fls. ; lower pale spreading, 1/3 longer than the upper; glumes rigid, acute. - Sea-coasts, N. Y. to Ga. and La. Aug.
45. PHRAG'MITES Trin. Reed. Spikelets 3 to 6-flowered, the lowest flower sterile and monandrous; rachis beset with long, silky hairs; glumes 2, acute, keeled, very unequal; lower pale subulate, silky-villous at base (except in the lowest flower); stam. 3; style 2; caryopsis free. - Grasses tall, with broad, flat lvs. and a large, diffuse panicle. 46. ARUNDINA'RIA Rich. Cane. Spikelets compressed, 5 to 12-flowered; flowers imbricated, distant; glumes 2, small, awnless; lower pale ovate, acuminate-mucronate, not carinate; stamens 3; stigmas 3; plumous; scales 3, entire; caryopsis free, deciduous. - Grasses shrubby or arborescent, often branched, the branches verticillate-fascicled. Fls. both perfect and staminate.